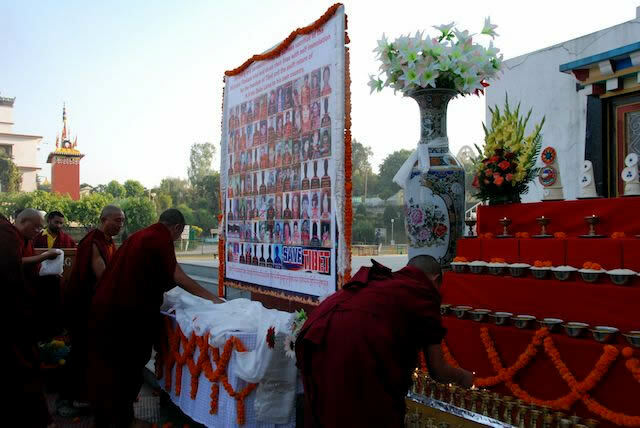 Jetsün Khandro Rinpoche offering khatags at the shrine where the photographs of the many martyrs were placed. On the auspicious full moon day of the 10th Lunar month of year of the Water Dragon (November 28, 2012), the Mindrolling Monastery held a prayer ceremony to commemorate the selfless sacrifice of the 90 brave Tibetans who, through self-immolation, laid down their lives for Tibet’s freedom and the return of His Holiness the Dalai Lama to Tibet. The prayer ceremony was presided over by H.E. Penam Rinpoche, H.E. Jetsün Khandro Rinpoche and Ven. Tulku Lhundrub Tengay of Mindrolling.